I don’t know what it is but I love arcades. Give me a seaside town, two pounds worth of 2ps and an hour in an arcade and I’m happy. This weekend we were in Southport for a wedding and despite only arriving at the hotel a couple of hours before the reception was due to start, we managed to squeeze in some time at the Funland arcades with our friends James and Sam. 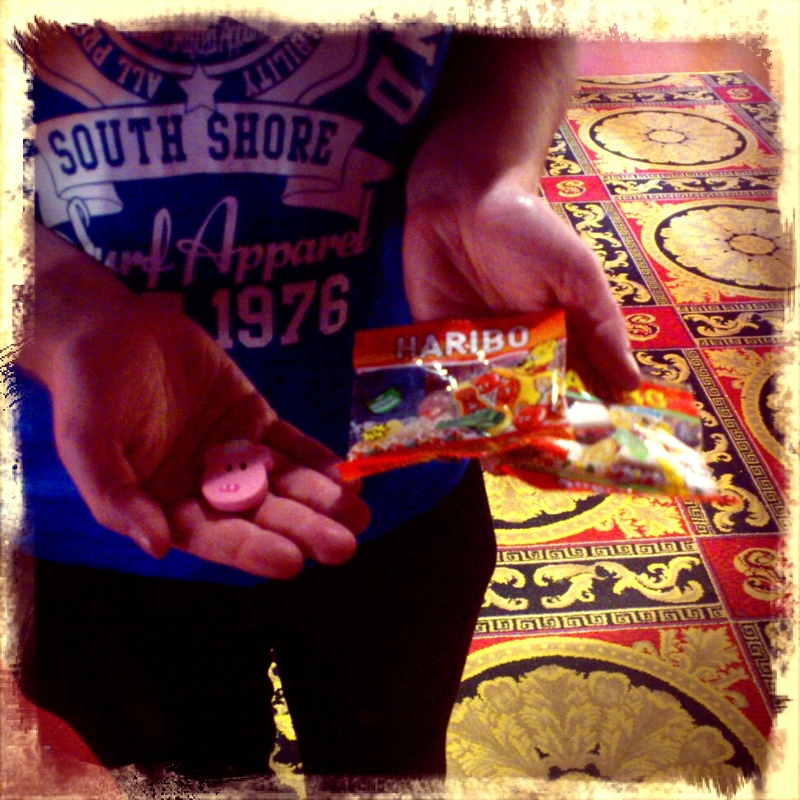 It was one of those arcades where you win tickets that can be converted into prizes – I think we came away with several novelty animal rubbers, some packets of Haribo, a notebook and some stickers. Which probably cost us about five pounds between us! It’s not the point though, is it? The wedding reception itself in the evening was lovely. Some particularly funny speeches from the groom and the best man, a fantastic band doing indie and rock covers… I don’t think most of us stopped dancing for about three hours! Today, Aidan and I are holed up upstairs in our house while a crew of builders put in a damp proof course downstairs. This involves all of the plaster being taken off the walls up to a metre high, the damp proof course injecting into the walls and then the whole lot replastering. Aidan has some weird middle-class fear of builders so I’m having to do the negotiations and chit-chat by default. Apparently because my dad was a miner that makes it easier for me to speak to them… I say it’s because he’s a softie middle-class so-and-so and is wasting his Barnsley heritage of being able to talk to anyone, anywhere and any time. I love a good arcade, epsecially the terrible prizes, they’re good for people watching too!! I love the little old ladies who sit there for hours on end, just feeding their two pences in… then give you evils when you win some on your first go! I loved the penny roller-bands , where you won when your 1p or 2p fell exactly between the lines , red lines for 1p and black lines for 2p. The band rolled toward you put the coin into a slot/chute which you could angle across the band! A variation of Penny falls you might say.